Tucked away in a wooded cove, this studio has all the decor you would expect from us plus privacy. It is near the other studios, so bring a group! The large hot tub and beautiful stone electric fireplace are only topped by the comfort you will enjoy in this cabin. Of course there is satellite TV with DVD, a full kitchen, washer and dryer, foldout sofa, private bathroom, and lovely appointments on the porch. Slip under the covers of the huge Kingsize bed and sleep in as looong as you want. Even if you are not a fisherman, you will love this for a getaway anytime. We just recently added this cabin to VRBO so it does not have any reviews. It is identical to our Deer and Bear cabins that have many reviews on this site. If there is a need for a larger cabin please look at Veiwpoint. Enjoyed our short two night cabin stay. Nice place and by itself with a few other cabins sitting nearby. A little trouble with the hot tub the first night and it was repaired next day. All in all it served our needs and we enjoyed the cabin and the setting. We loved this cabin! 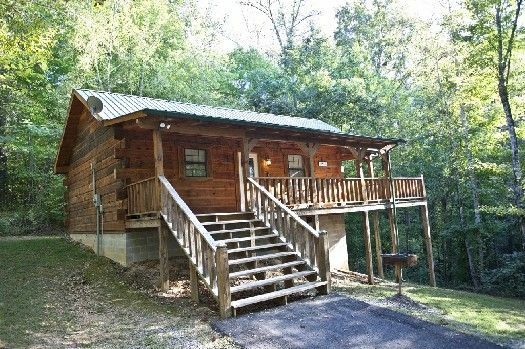 We have stayed in a lot of cabins in the Gatlinburg area that try to achieve a similar feel and fall just short somehow. This cabin was GREAT - very clean, and the layout was one of my favorites we've stayed in. It's also really close to the activities we were interested in (hiking and fly fishing along the Tellico River). Definitely recommend and will be back! I really have no complaints. We had an amazing time. When we first walked in after a long trip there was soft jazz playing along with the fireplace going. It was instant relaxation after a stressful trip! Doug responded to any and all questions I had super quick making me feel at ease that if there was a problem when we got there I knew we would be able to get a hold of him right away. Overall it was an incredible getaway and we can’t wait to come back! This is the second year in a row we have stayed here, and we absolutely love the quiet and comfort of this place. Loved the cabin. Thank you Mr Morris for the info on the Bald River Falls and Cherohala Skyway. The Falls were well worth the drive. It was amazing. We will be back soon. Glad we chose to stay at the Angler, set away from the other cabins. Everything you could need and at an unbeatable price. Will definitely be returning!